The majority of this column is taken from Robert F. Kennedy, Jr’s World Mercury Project website. The column tries to de-mystify the annual freak-out frenzy surrounding the aggressive annual campaign from Big Pharma, Big Media, Big Medicine and various medical industry lobbying organizations (such as the AMA (American Medical Association), the AAFP (American Academy of Family Practice), the AAP (American Academy of Pediatrics) and ACOG (the American Congress of Obstetricians and Gynecologists) to urge everybody to mindlessly “just get your damn shots” without being given a chance to think about it and perhaps ask about the potential downsides of getting the inoculation (look up “informed consent”). There is a lot more to that simplistic annual advertising campaign than meets the eye. The following article (and the first chart) should be a good introduction to the topic (especially if you are pregnant and are being urged to simultaneously get an aluminum-laced DTaP shot). The first chart illustrates the slight-of-hand involved when the CDC and most public health departments claimed credit for the improved mortality rates of various common childhood infectious diseases like measles, whooping cough, chicken pox, etc. In fact, as has been explained on these pages before, almost all of the credit for such improvements should rightly be attributed to improved sanitation, improved nutrition, improved refrigeration, better public health campaigns relating to quarantine etc. Any improvements in the lethality of such infections had nothing to do with vaccination campaigns. They were Johnny-come-lately realities. Measles vaccination programs only came on the scene years after the mortality had already dropped to zero. There may have been some weak correlation, but that, as we in the medical profession like to say when we try to discount the successes of alternative medical treatment, does not mean causation. (For more on this topic, including seeing some important graphs that prove that the incidence and mortality of many childhood illnesses were already approaching zero years before any mass vaccination program had even started, read my Duty to Warn column, entitled An Honest Look at the Historical Evidence That Debunks the Popular Myth That Says That Vaccines Eliminated Childhood Infectious Diseases. It has been archived at http://duluthreader.com/articles/2017/06/14/10297_an_honest_look_at_the_historical_evidence_that . The remainder of this column is devoted to a recent fine article from Robert F. Kennedy, Jr’s World Mercury Project Team (google it!). In it, the project revisits the annual propaganda push that comes from Big Pharma and their cozy partners in the Big Vaccine-infiltrated CDC that has been pushing mercury-laced inoculations on everybody in sight for decades, with no recognition of the fact that intramuscularly-injected mercury is a known neurotoxin, especially to fetuses, infants and their mothers and 100 times more poisonous than lead. The first graph depicts the annual mortality from seasonal influenza in America. It is a good place to start the discussion. Note that the annual mortality rate approaches zero (1.4 deaths per 100,000). Pretty good odds if you are thinking of forgoing the costly and potentially toxic vaccine – which frequently fails to protect against the flu anyway. 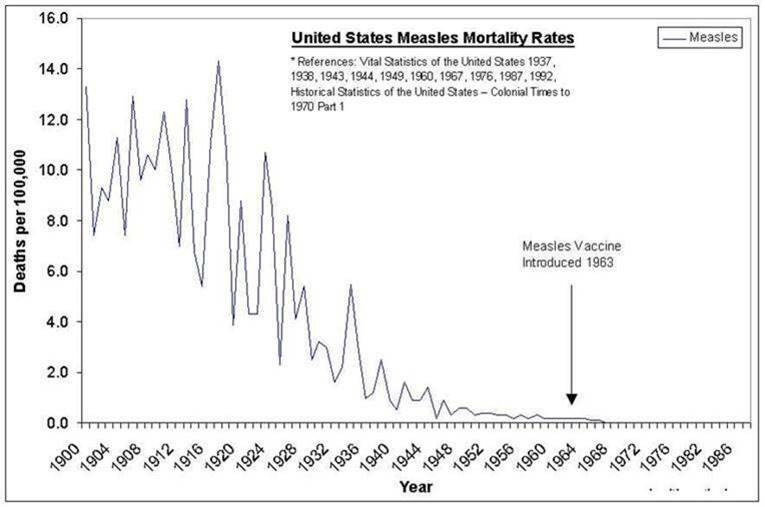 The second graph show that measles mortality had already approached zero by the time a mass vaccination campaign was begun in the 1960s. Be aware that an infant whose immature blood-brain barrier can easily allow mercury into the brain (and also the neurotoxin (and autoimmunity-inducing) aluminum from many of the other vaccines (such as a DTaP shot) could actually have a greater chance of being permanently brain-damaged from the highly toxic mercury in the shot, than from dying from influenza, which is commonly not prevented at all by a flu shot (whose contents represent just a bunch of guesswork before there is a committee decision about which of the 3 or 4 influenza viruses (among the hundreds of potential choices each season) are to be included in the vaccine next fall. (Note that the very cunning CDC, in its annual statistical reports, intentionally does not separate out the deaths from pneumonia (of all causes) from the deaths from seasonal influenza. It appears that they are so heavily invested in selling vaccines for Big Pharma’s mass vaccination programs, that they try to scare the population by repeatedly claiming that over 36,000 people die annually from those two diseases. The fact is that in many years only a few dozen people die from influenza but tens of thousands (mostly the malnourished, chronically ill and elderly) consistently die every year from any of a large number of causes of pneumonia – despite there being a vaccine for one of the types (pneumococcal pneumonia). Here are some quotes that pertain to the article below. “You want to do everything right for your child, and would never knowingly allow someone to inject a neurotoxin into your infant. Before getting a flu shot, you need to know this: MERCURY is a NEUROTOXIN”. 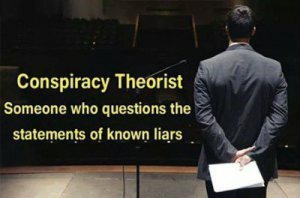 (Ed note: But so is the aluminum that is in many other vaccines, in particular the DTaP vaccine that the CDC, the AMA, the AAFP, the AAP and ACOG are currently endorsing – along with various multinational pharmaceutical corporations and Big Pharma’s various academic physicians – that are the ones who have long been setting the vaccination guidelines for pregnant women, their fetuses, their babies, their older children and us adults). The World Mercury Project is deeply concerned that the risks of getting mercury-containing seasonal influenza vaccines may outweigh the benefits for pregnant women, infants and children. Mercury is known to be highly toxic to brain tissue and can impact critical stages of brain development. A 2017 CDC study linked “spontaneous” abortions (some of which were actually “iatrogenic” disorders [ie, doctor- or medical-treatment caused]) to flu vaccines, particularly in the first trimester. Pregnant women vaccinated in the 2010/2011 and 2011/2012 flu seasons had two times greater odds of having a miscarriage within 28 days of receiving the vaccine. In women who had received the H1N1 vaccine in the previous flu season, the odds of having a miscarriage within 28 days were 7.7 times greater than in women who did not receive a flu shot during their pregnancy. A study published in 2016 that looked at the safety of flu vaccines found a moderately elevated risk for major birth defects in infants born to women who had received a flu vaccine during the first trimester of pregnancy. A study published in 2017 found an elevated risk of autism spectrum disorders in children whose mothers had a first trimester flu shot. Flu vaccine administration is documented to cause an inflammatory response in pregnant women. Recent research found inflammation during pregnancy associated with the development of autism spectrum disorders. Mercury rapidly crossed the placenta and accumulates in the fetus at higher levels than in the mother. Two studies in 2012 showed that a mother’s mercury exposure is linked to attention problems in her children. It is inconsistent to recommend vaccines containing ethylmercury when also counseling pregnant women to avoid seafood high in methylmercury due to the known harmful effects that mercury can have on the developing fetus. Thimerosal-containing flu vaccines contain 250 times the mercury level that the EPS uses to classify hazardous waste. Unused thimerosal-containing flu vaccine should be returned to the manufacturer for appropriate disposal. If You Are Pregnant or Have Small Children . . . If you decide to vaccinate, insist on mercury–free influenza vaccines for yourself and your children and do not get a flu vaccine the same day as other vaccines. Do not let yourself be pressured into receiving a vaccine that you don’t want; should you choose to vaccinate, insist that your doctor or pharmacist find you a mercury-free vaccine. If mercury-free vaccines are unavailable, look at the evidence and decide if the influenza virus is a significant concern for your family. 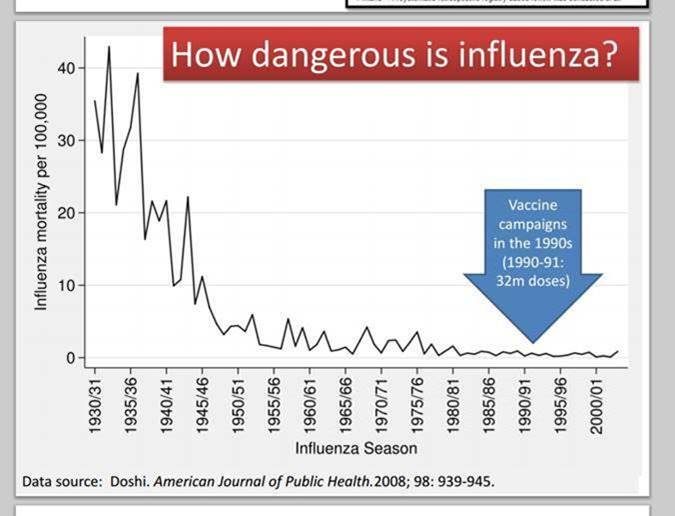 Also, consider the evidence regarding the effectiveness of the flu vaccine is actually preventing influenza. For information visit www.summaries.cochrane.org. All vaccines, with or without mercury, pose health risks. However, the influenza vaccine is of great concern, as many brands contain high levels of mercury in their multi-dose vials. Be sure (both you, your doctor and your nurse) read the package inserts for any vaccine prior to getting vaccinated. A study that compared children who received flu vaccine to those who did not found no significant difference in the rate of influenza between the active and placebo groups. It also found that the group of children who received the flu vaccine had a 4.4 times relative risk of non-influenza respiratory tract infections. An Australian study found one in every 110 children under the age of 5 had convulsions following vaccination with the FLUVAX H1N1 vaccine in 2009. Additional research found a spike in cases of narcolepsy in children associated with the H1N1 vaccine. A review in the medical journal The Lancet found a lack of health benefits from influenza vaccine in children under age two along with significantly increased rates of vaccine-related adverse events. Download and print our flu vaccine brochure. Share with your family, friends, doctors and community leaders and visit our flu vaccine web page. They are full of flu facts to help you make informed decisions about your family’s healthcare. Cochrane Report 2014 (page 2. If any recipient of this message prefers to not receive future emailings from this address, please reply to this email with “unsubscribe” and your name in the subject line. Thank you for taking the time to write this. I am not against vaccination but I am for informed vaccination. This topic is very sensitive and it is hard to talk to mothers about this sometimes because they can be very close minded. My first child got all the shots because I did not know better, my second one on the other hand is not fully vaccinated and I intend to keep it that way. There is no need to have vaccinations for every single disease. How can one acquire immunity naturally this way?